Tom Sawyer has graciously agreed to share with us an excerpt from his memoirs in which he describes his experience working for Al Capp in the early ’60s as one of his assistants. Many thanks, Tom! One morning in my studio I received an unexpected phone call that turned out to be the catalyst for the next dramatic changes in my life. 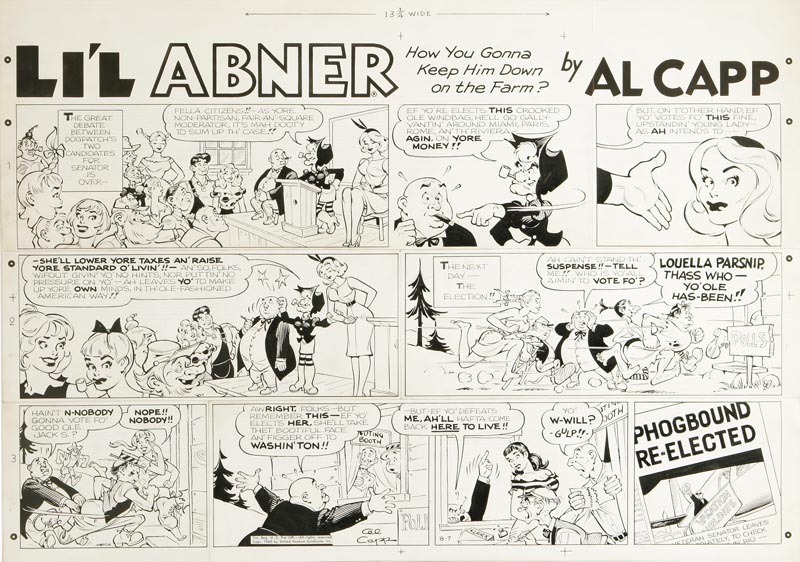 The caller was the legendary cartoonist/humorist Al Capp, creator of the phenomenally successful comic-strip, Li’l Abner, the influence of which had been felt all over America for many years. 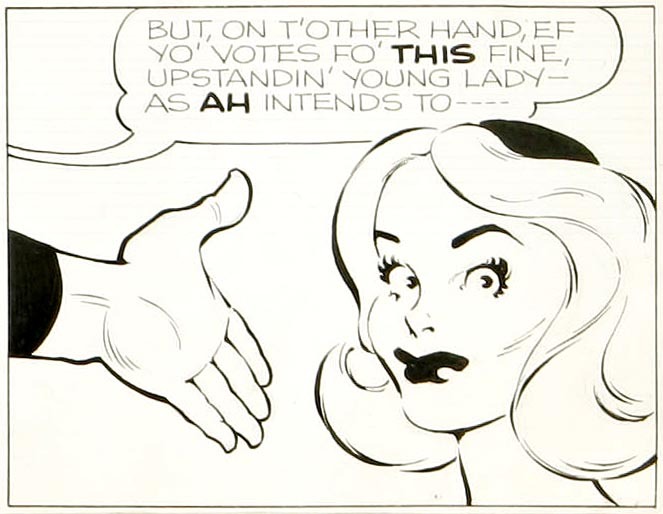 Though I had met Al once or twice at cartoonist functions, we didn’t ‘know’ each other. But having heard him on radio and on TV interviews, I immediately recognized that garrulous voice and singular, bigger-than-life laugh. Al explained that he had this problem. His inker/assistant-artist of 20-some years – the guy who penciled all the realistic (non-cartoon-ish) figures – had had a stroke, and Capp was desperate. He explained that he’d called around to the likes of Stan Drake and others for the name of an artist who could do this sort of work, and I was at the top of everyone’s list. What Al needed was for me to spend every other week at his studio in Boston for at least the next few months, where I’d be provided with a bed and food. I thanked Al, said I was flattered – which I was – but no, I couldn’t. I told him the truth, that I was up to my eyeballs in work. I wasn’t trying to be cute – though it was not a gig that interested me. To avoid insulting him, I did not spell out that I definitely had no intention of serving as assistant to anyone. 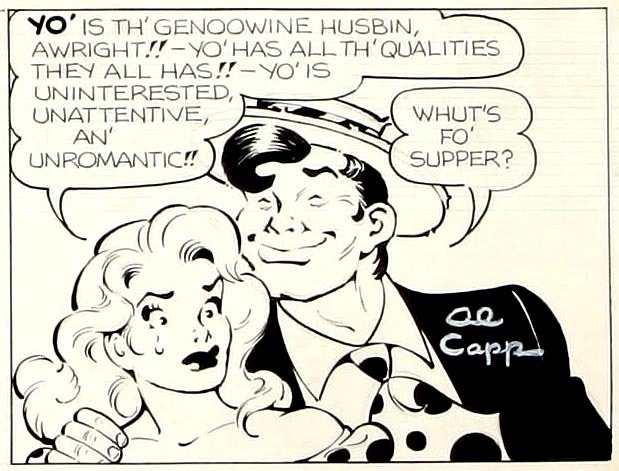 Even Al Capp. Further, doing alternate weeks in Boston was even less appealing. Outside my studio window the trees wore that lovely green haze of new leaves that signified the end of another endless New England winter, and almost the last thing I wanted to do at that moment was leave town. But Al refused to let go. As if reading my mind he did a pitch for his studio, a lovely, charming converted carriage-house at the foot of Beacon Hill, with the best of Old Boston – Charles Street, the river, the Common and the Public Gardens only steps away. Again I said no, this time adding what I figured would be my closer: that my price was too high. He couldn’t afford me. 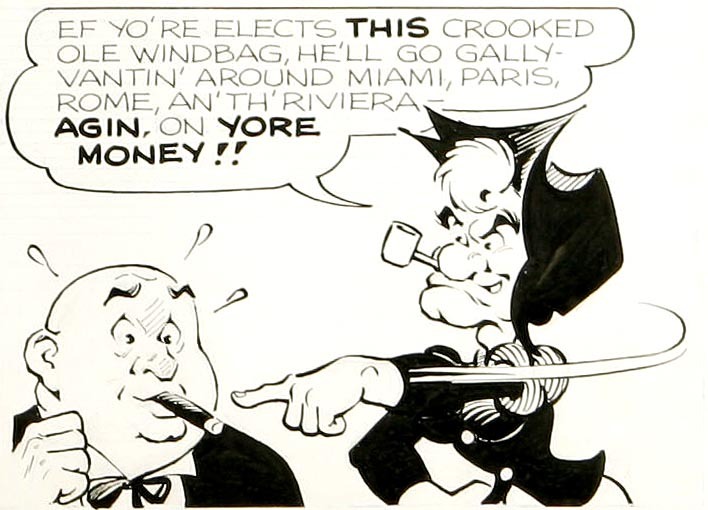 … Al Capp turned out to be one very entertaining guy. As expected, major funny, brilliantly politically aware, and commercially, brilliant. This last evidenced, especially, in that Al, a lifelong Liberal, and JFK fan, who lived in Cambridge and socialized with the Kennedys, the Schlesingers and others of the Best and the Brightest, had discovered that on the lecture-circuit at that time there was no longer any money in being a Leftie. 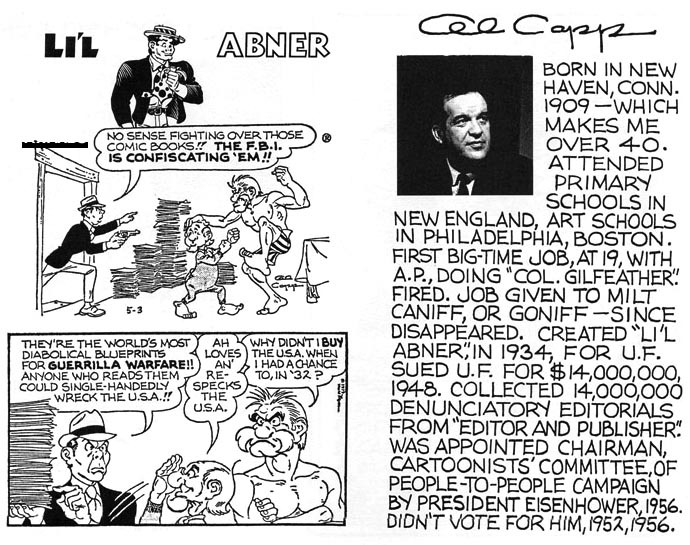 So Al Capp became, arbitrarily, an articulate and of course witty spokesperson for the far-Right. He never believed a word of what he said, but the demand for his services as a speaker increased dramatically, and his fees jumped from $3,000 to $10,000. Al was unique in other ways. 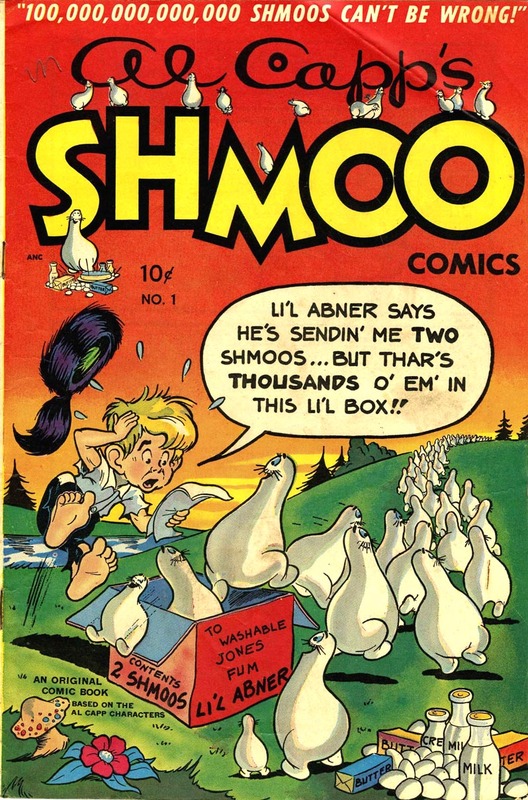 Famous for, in addition to his comic-strip, his wooden leg (as a boy in Bridgeport, Connecticut he’d fallen off the back of a truck and been run over by a trolley-car), about which he joked… …A word about how Al produced his justly renowned comic-strip. He wrote all of it, often while talking – and guffawing at his own jokes. In addition to a lettering-man, there was another long-term assistant, Andy. Italian-American, late-sixtyish, permanently depressed, a bachelor whose social life seemed to consist of nightly visits to the local dog track, where he regularly gambled and lost, Andy penciled the strip’s humorous, cartoony figures. After I drew the more realistic ones, mainly the voluptuous girls, I inked all of it – except for the faces. Al did those – with a very personal, singularly sensitive line that nobody could have imitated. And of course – especially while Al was present – the studio was filled with more or less constant, funny chatter, Andy’s wry one-liners and responses being uniformly as dark as his life-view, which was nailed for me by the calendar he kept push-pinned to the upper corner of his drawing table. One of those month-per-page affairs, it was laid out with a roughly one-inch square box for each day. And every morning, upon arrival, Andy’s first move after seating himself was to grab a soft pencil and, carefully staying within the borders, completely blacken that day’s box. By the end of a month, the entire page was black. 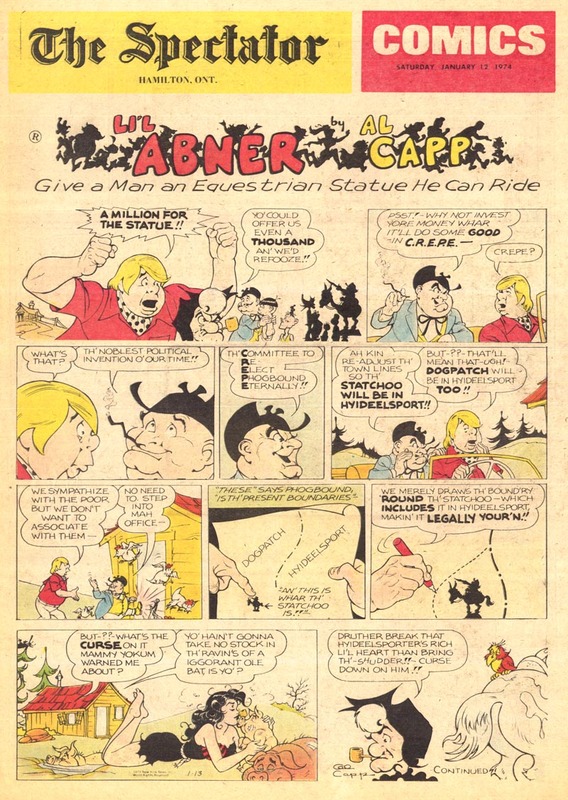 Though the work I did on Li’l Abner wasn’t challenging, it was turning out to be a relaxed, pleasant gig, highlighted in that first week by a couple of late-evening dinner excursions with Capp, just the two of us – and the great, entertaining conversations that went with them. * Many thanks to Tom Sawyer for sharing this wonderful excerpt from his memoirs with us. 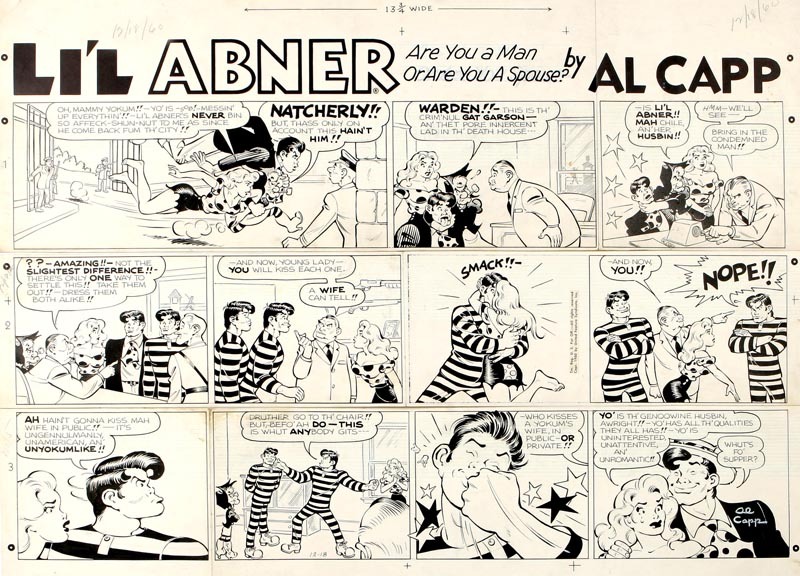 The text of today’s post is Copyright © 2010 by Tom Sawyer Productions, Inc.
* Also, Terry Beatty has some amazing Al Capp/ Li’l Abner rarities on his blog! Go take a look here, here and here — thanks Terry!